Roberto Calvi was the chairman of Italy’s second largest private bank, Banco Ambrosiano. He was dubbed “God’s Banker” by the press because the Vatican was the bank’s main shareholder. So what sort of chart might we expect for someone with such a title ? The first thing to look for in an astrology chart is the Sun and Calvi has it in Aries in the 8th house. In the piece about Richard Branson it was revealed that many of the world’s richest people have the Sun in the 8th house as this placing indicates someone who is very good at organising and manipulating other people’s money and resources. With the Sun in Aries in this house, it would suggest that Calvi was extremely assertive and even cavalier with other people’s cash. The material houses in astrology are the 2nd of money and possessions, the 6th of work and the 10th of career. Anyone who is successful in the world of finance would expect to have these houses significantly tenanted. 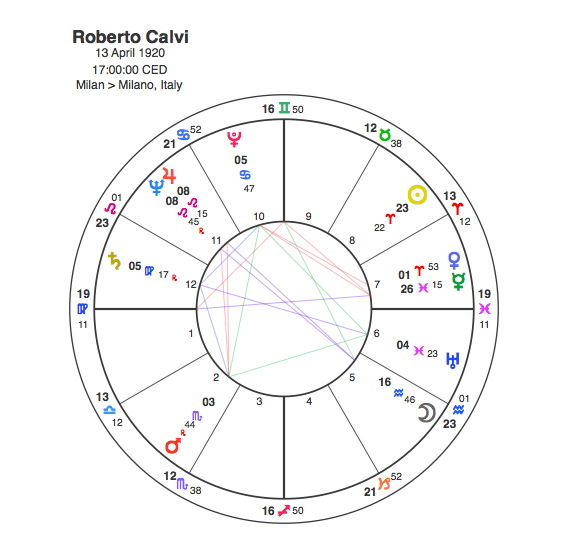 Incredibly Roberto Calvi has the most favourable aspect pattern in the whole of Astrology, a Grand Trine with planets in all three of these houses. A Grand Trine is formed when 3 planets are connected by flowing, harmonious 120 degree aspects in signs of the same element, in this case Water. What this means is that these planets are all acting in a similar and compatible manner so they feed each other. Calvi’s Grand Trine is extraordinary in that all 3 planets involved are contained within 2 degrees, one of the closest formations Capricorn Research has seen. It is based around Mars in Scorpio in the 2nd house, which in itself points to an extremely strong and intense drive to attain great wealth and to do it in very organised and manipulative, even secret ways. Mars is in trine to Pluto and Uranus, suggesting a flair for using unconventional methods to acquire and manage finances combined with the ability to make sudden, dynamic and impressive career decisions that would bring great advantage to himself and to his clients. There is a certain fluid, ruthlessness about this pattern and its no wonder he was the chairman of a private bank. If God wanted a financial adviser, it would make sense to choose someone like Calvi. As Calvi was given the title ” God’s Banker ” we should look for evidence of this in his chart. How would we look for God in an astrological chart ? The Absolute Divine Creator could not be found in this way, but we are actually looking for an idea of God as portrayed by the Italian press. For this God would have to start with Jupiter, the king of the Roman gods. The one planet that represents the infinite, unseen and mysterious spiritual realm is Neptune. So a Jupiter / Neptune conjunction could do justice to the Almighty. What sign would it be in ? – its a no brainer it would have to be Leo. What house ?, as we are talking about an idea and an ideal it would have to be the 11th house. Roberto Calvi has an exact Jupiter / Neptune conjunction in Leo in the 11th house so this is the astrological symbol of God in his chart. Jupiter and Neptune make a square aspect to Calvi’s Mars in Scorpio in the 2nd house, so he is ” God’s Banker “. The fact that its a difficult square aspect would suggest the Almighty would be wise to keep an eye on him however, in case he used the divine capital for personal gain. In a way, the Grand Trine in Water adds to the evidence of Calvi being God’s Banker as Water signs deal in the mysterious and intangible. Calvi’s Grand Trine forms a Kite formation when it includes Saturn. A Kite is where one of the planets makes an opposition to another planet which is also sextile ( 60 degrees ) to the other two. Saturn is opposite Uranus and sextile Mars and Pluto. A Grand Trine is an exceptionally fluid and easy aspect, when it creates a Kite the opposition gives some specific focus to the energies because it adds a degree of difficulty and challenge. Saturn rules traditional authority figures and in Calvi’s chart it clearly represents the Vatican. Saturn is in Virgo, a sign strongly associated with the Catholic faith through its connections with the Virgin Mary. There have been claims made that the Mafia may have used Calvi’s Banco Ambrosiano for money laundering. It seems that Uranus in Pisces represents the Mafia. Uranus is the unconventional and when in difficult aspect often has connections with criminal activity. Pisces is a sign that often deals in things that are unclear and have no definite substance. The secretive, shadowy and murky world of money laundering ( Water signs ) seem to be indicated by this placing. As a general rule a Grand Trine brings a certain comfort to the person’s life, everything comes easily and as a consequence many people with this pattern expect things to come to them without effort. The Kite adds a level of challenge and difficulty that keeps the person on track because they are constantly having to juggle the conflicting demands of the two planets in opposition. So Calvi has this exceptional money making Grand Trine but the tensions in his life would revolve around trying to keep both the Vatican ( Saturn in Virgo ) and the Mafia ( Uranus in Pisces ) happy. With a Grand Trine, things will often go quite swimmingly but as usual everything is blown out of the water when Pluto makes it’s once in a lifetime transit to the Sun. Pluto was opposite Calvi’s Sun in 1981 – 1982. It’s important to remember that the 8th house is not only the house of other people’s dosh but also the traditional house of death, so when Pluto, the planet of death and rebirth makes an opposition to an 8th house Sun, we should be worried. The Bank of Italy produced a report on the Banco Ambrosiano, which found that several billion lire had been exported illegally, leading to criminal investigations. In 1981, Calvi was tried, given a four-year suspended sentence and fined $19.8 million for transferring $27 million out of the country in violation of Italian currency laws. Calvi’s family maintains that he was manipulated by others and was innocent of the crimes attributed to him. In June 1982, Calvi’s body was found hanging from scaffolding beneath Blackfriars Bridge in London. The choice of place was odd as Calvi was a member a masonic lodge, P2, and members referred to themselves as frati neri or “black friars”. Calvi’s death was the subject of two coroner’s inquests in the United Kingdom. The first recorded a verdict of suicide in July 1982. At the second inquest, the jury recorded an open verdict, indicating that the court had been unable to determine the exact cause of death. Calvi’s family maintained that his death had been a murder. Pluto transitting opposition to an 8th house Sun would have most astrologers expecting their client’s death, so it would seem that this was the end of the story as far as Roberto Calvi was concerned. There does remain the question as to whether or not he was murdered, however. It does seem strange that a birth chart can still have an effect after the person’s death, but transits can continue to the birth positions so this can sometimes affect the legacy of the person. An example of this was the case of Jimmy Savile whose post death transits seriously impacted on how his life was viewed. There were no major transits to Roberto Calvi’s chart until 1990 – 91 when Pluto was square his Moon. This coincided with three films linked to his death. In one a fictionalized version of Calvi appears in the film The Godfather Part III. In the second, The Comic Strip Presents,there was a spoof version of Calvi’s story under the title Spaghetti Hoops. The Calvi affair also inspired the comedy film The Pope Must Die. More to the point in July 1991, a Mafia informer claimed that Roberto Calvi had been killed because he had lost Mafia funds when Banco Ambrosiano collapsed. The next transit was 2002 – 3 when Pluto was square his Ascendant. An independent forensic report, published in October 2002, concluded that he had been murdered as the injuries to his neck were inconsistent with hanging and he had not touched the bricks found in his pockets. In September 2003, the City of London police reopened their investigation as a murder inquiry. In spite of a trial in Rome, in 2007, when five people were acquitted of the murder, no one was found guilty, so the case remains unsolved. Looking at his chart, Mercury conjunct Venus in Aries in the 7th house in square to Pluto suggests Calvi had many powerful enemies. It was Pluto opposite Calvi’s Sun that resulted in his murder, but his Sun had no aspects in the chart so we have no clues about who committed it. Roberto Calvi’s chart showed he was ” God’s Banker “. Unfortunately it looks like he may have been dealing with the Devil as well.